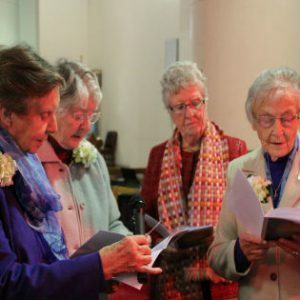 Sr Eileen celebrated her platinum jubilee with two other Sisters of Charity, Sr Helen Malone and Sr Marguerite Moloney. Congregational leader Sr Clare was on hand to congratulate her. “I am so glad to be able to share your jubilee with you. As Pope Francis says, the eloquence of your life is what brings apostolic effectiveness and you have done that magnificently for 70 years. “In that time, you have ministered in education, leadership roles, and the healing ministry of Christ at Caritas Christi Hospice, Kew and Corpus Christi, Clayton. Seventy years of ministry, or going where you were called. “Tucked away in that 70 years was a time in Bundi, Papua New Guinea as principal of St Francis of Assisi school. You were always ready to go where you were called. Always reading the signs of the times. Always a yes to what was asked of you in serving the poor. 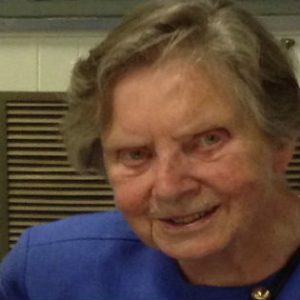 As Superior, you cared about the individual Sister, and as a leader you were tireless and whole-hearted in your ministry. “You supported those who struggled and championed the underdog. “When you were at Caritas Christ Hospice, Kew, as hospitality Sister, a role of welcome and giving time to the distressed and grieving, you found yourself loved and welcomed by all. The staff grew to love you very much and your role as the one who welcomed those entering CCH and showing the Sisters’ hospitality, was appreciated and valued by all. “You spent many years in caring service to the most vulnerable patients and families who need your gentle way and your loving kindness. The staff experiences that care on a daily basis. “On leaving CCH and going to CCC, you have cared generously for our Sisters in care at Clayton. Yu are a friend and companion to all. A true daughter of Mary Aikenhead. Thank you, Eileen! “On the day of your profession, you took as your motto ‘I can do all things in Him who strengthens me.’ (Ph 4:13) May God continue to strengthen you, dear Eileen. “You have great love for your family and they for you, especially your nieces and nephews. May their love continue to support you. May you feel God’s presence with you, walking beside you in the moments to come.